Here is this week's edition of Tough Call. 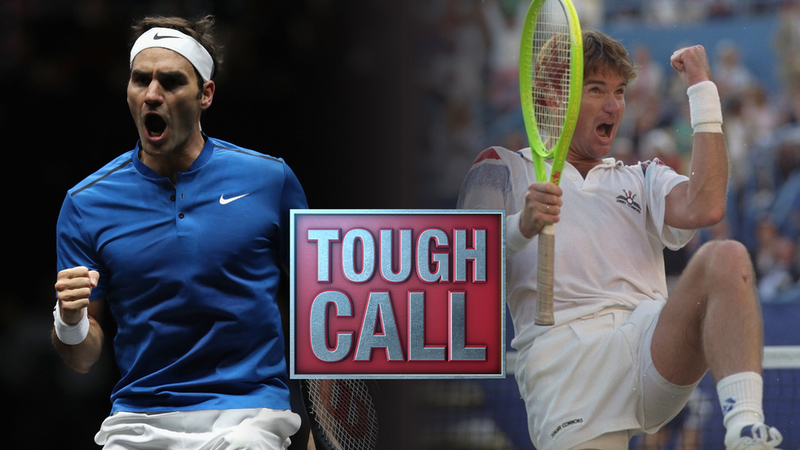 Will Federer catch Connors' record of 109 Career titles? ~ He’s won seven titles this year, with potentially an eighth coming at the ATP Finals in a few weeks, so if he keeps this pace up he could pass 109 in the next two years. ~ If he can keep up his recent dominance of Nadal, it eliminates a factor that was keeping him from piling up titles the last several years as Nadal dominated their head-to-head. ~ Even though he had an incredible 2017, that doesn’t necessarily mean he’ll play as well in 2018 - even the Big Four have rarely put together back-to-back incredible years. ~ If Novak Djokovic and Andy Murray return to the tour healthy in 2018, they could prevent not just Federer, but Nadal too, from dominating the tour like they did in 2017. Maybe it's this record that keeps Roger going. To tie it, he'd need two more seven-title seasons on top of the one he just put together. I don't see that happening, nor do I see Federer playing until he's 40 and maintaining a 3.5-title average per year. Getting to 100 will be a big enough deal for Federer, and that is a realistic goal. Federer needs an intimidating 14 titles to catch up with Connors, and at the age of 36, that’s an incredibly tough ask. But it would be out of line to vote against Federer after his nearly unbeatable play in 2017. He has won seven titles this year and could nab an eighth in London. With tentative plans to play for two more years, getting to 109 is certainly possible. Federer needs to win 14 titles to catch Connors, a seemingly achievable feat when you consider that he has won seven alone this season. But go back a little farther and things get less certain; Federer didn't win any in an injury-plagued 2016. When he came back in 2017, he said he would likely play for three years. That gives him two more seasons, at the end of which he'll be 38 years old, to win 14 events. I believe Federer will surpass Connors. He is only 14 behind Connors now. I believe he will play through 2020. He will be the favorite to win the ATP Finals in a few weeks and he figures to win somewhere between 10 and 12 titles over the next two years. That would put him within striking distance by the start of the 2020 season. He will be 38 then but,as long as he paces himself as well as he did this year, Federer will be poised to break the Connors record some time that year. Tough as it will be, I like Federer's chances of realizing this lofty goal. Federer had one hell of a 2017 season. However, the reason why he did so briliantly was because he played only half of 2016 and didn't play the whole 2017 season in order to give his 36-year-old body a rest. Chances are he won't be able to have a year like this again as he only has a couple of years left on tour. In order for him to catch Connors, he'll need to win 14 tournaments. I don't see him achieving this feat at this point in his career. As Federer continues to get older, I think we can expect him to play fewer and fewer tournaments in order to keep himself fresh for majors. And while it's possible he wins a few more of those, I just don't see him racking up titles as he gets closer to 40.